The pleasure garden here was once a bombsite, then a derelict playground, before it was imaginatively re-designed by the Bonnington Square Garden Association, a group of local residents with backgrounds in film, art, design and horticulture. Funded by grants and local sponsorship, the garden includes a 9-metre Industrial Revolution iron waterwheel, a huge Helping Hand sculpture and evocative, lush sub-tropical planting. Further planting under the umbrella of the Paradise Project includes trees, groundcover planting, vines and endless street gardens. 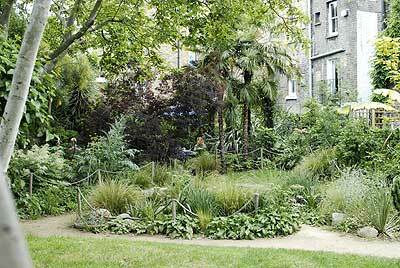 The pleasure garden is today regarded as one of the finest community gardens in London.